One does not go to Chicago to merely “see the sights”, although the sights are quite worth the visit, alone. 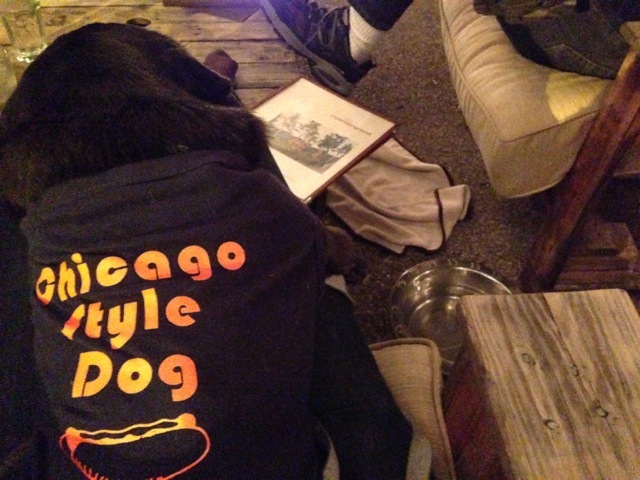 But I have long understood that Chicago is also very important for it’s food. 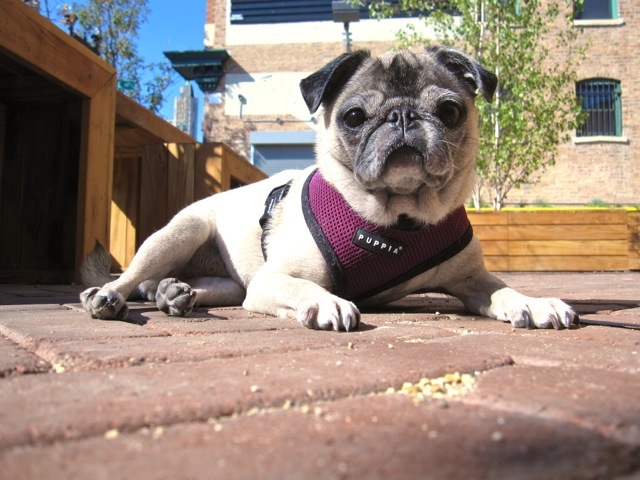 We were slightly limited to patios that accepted dogs, and many patios do accept polite dogs in this city (how terribly civilised!!! ), but that sure didn’t stop us from indulging. 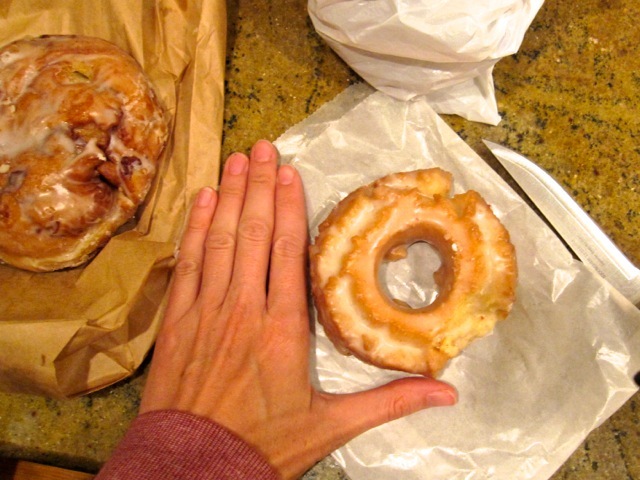 …doughnuts made for Godzilla, apparently. Only on vacation, and only in Chicago? You know how you say you’re “only going to have a little piece”? Yah. Well. That didn’t happen. But humans cannot live on doughnuts, alone (or can they? ), so we decided to attempt to walk off a bit of our collective sugar high, and we headed to a different part of town for lunch. It was a perfect day, weather-wise, so there was a bit of a line up for the patio, but Daisy took that as her opportunity to work on her tan and recharge her solar batteries. 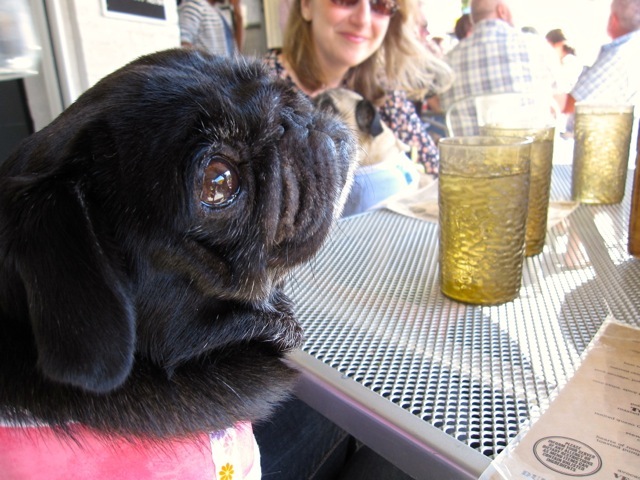 When we did make it in to the table, Lola Pug had a lot of questions for the waitstaff about the menu. 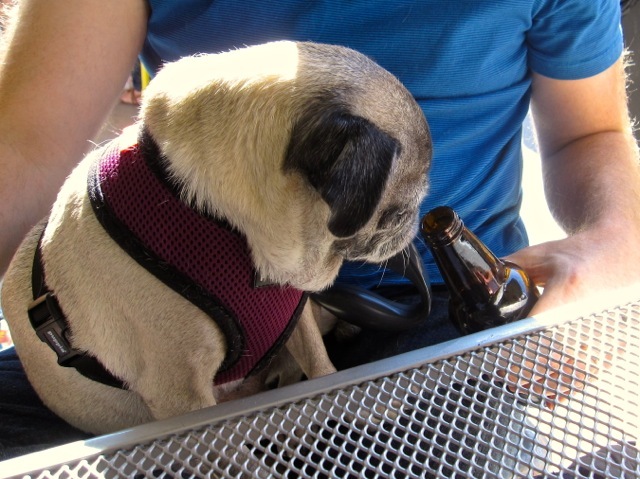 …while Daisy checked out her Dad’s sarsaparilla. She was less than impressed, in case you were wondering. Being a vegetarian, I simply ordered (blindly) whatever was labelled as vegetarian on the menu. This dish of mushroomy goodness was a total winner – for veggies and meat eaters alike. When this was put down in front of me, I was a bit confused. 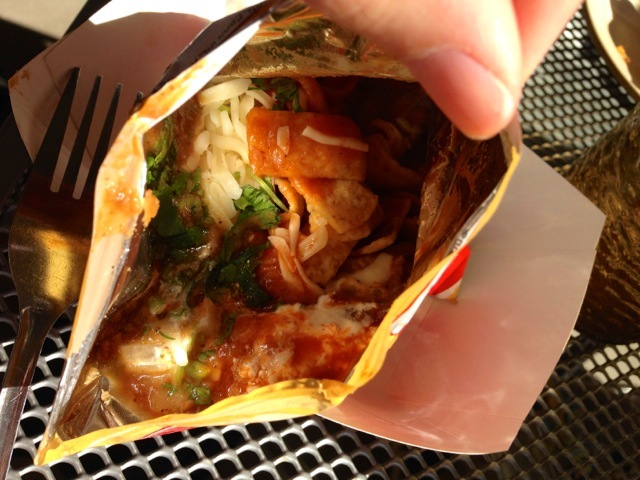 I am not normally a Frito-eater, but I gamely opened the bag, stuck my fork in, and now I have a full comprehension of what a “walking taco” is all about. 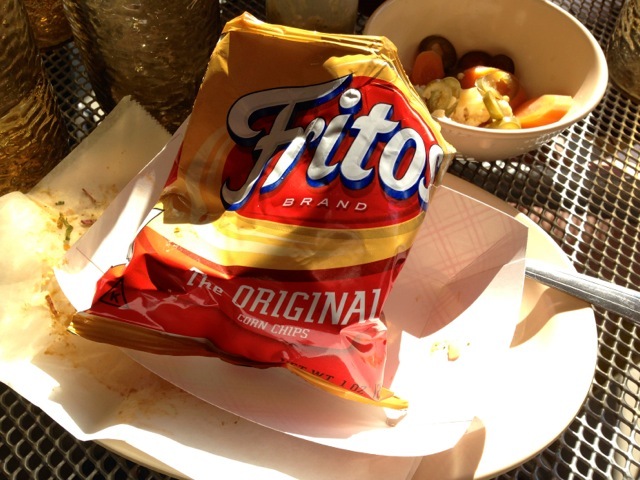 Fritos, cheese, hot tomato sauce and green things. Perhaps a snack best left to those late nights when you’re just coming home from the pub. 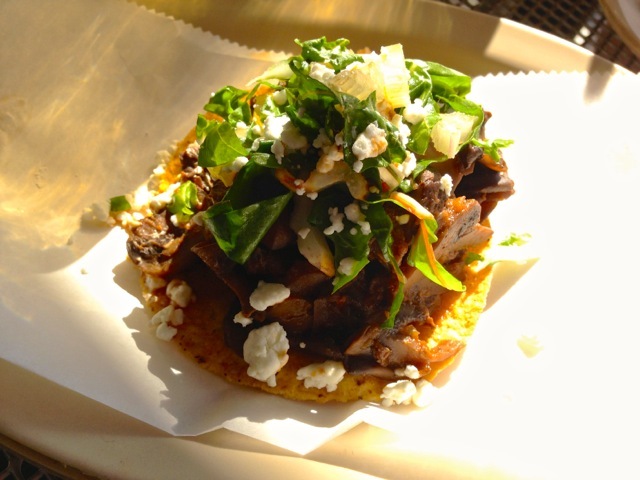 Kind of the Chicago equivalent of a Nova Scotian donair, I suppose. We continued on our way after lunch, exploring some really fun shops, visiting a great art fair and buying a few appropriate items for les chiens. 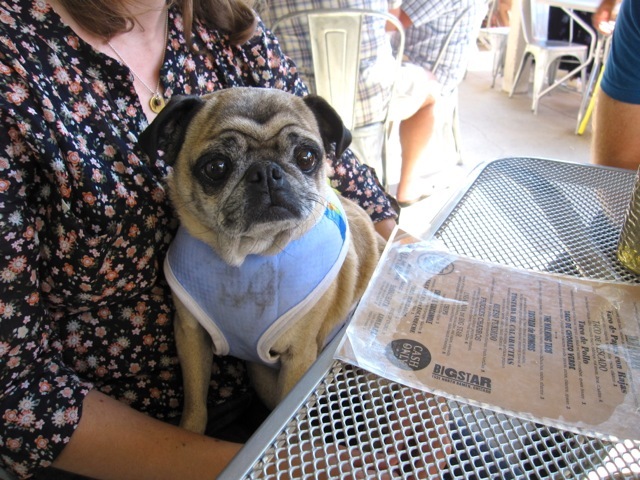 Lola Pug was kind enough to wear her tourist gear at dinner that evening – food related, of course! 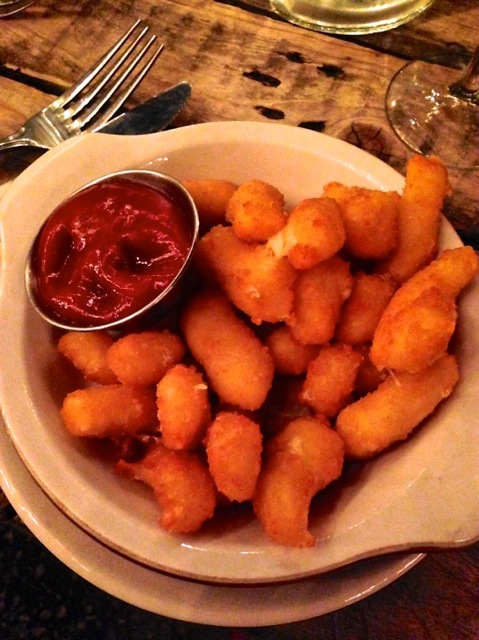 Deep fried Wisconsin cheese curds with spicy ketchup. 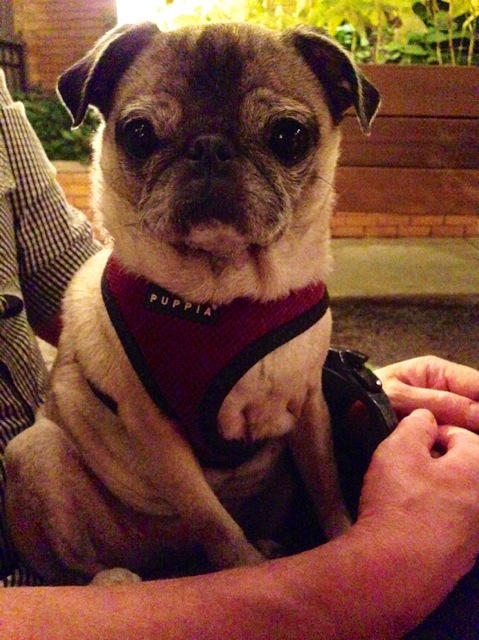 …or maybe she’s irked because this blog is supposed to be about PUGS, not FOOD! Okay. Next post coming up. And it will be ALL about pugs, I promise. Now. Time for a snack, I think. I think this post has D&D wondering why they didn’t get some doughnut and cheese curds. Uh oh! Fortunately my GrandPugs have short memories so you’re probably fairly safe for your next visit which better include Gammy and Gampy!!!! OMG. I apparently need to go to Chicago for that one reason.